Our current pipe organ is the second one installed in this church since it was built in 1930.It replaced a used theater style "horseshoe" shaped console pipe organ that original came from the Majestic Theater in San Antonio, Texas. Theater organs were used before the "talkies " were invented and silent picture movies were the norm. This organ even came equipped with a bass drum,cymbals, snare drum, fire siren, and even a whistle but was never hooked up for obvious reasons. Prior to that organ, reed or foot powered "pump" organs were used. Out of all the churches in Del Rio, only three other pipe organs are used and in existence, besides one that is in a private residence. 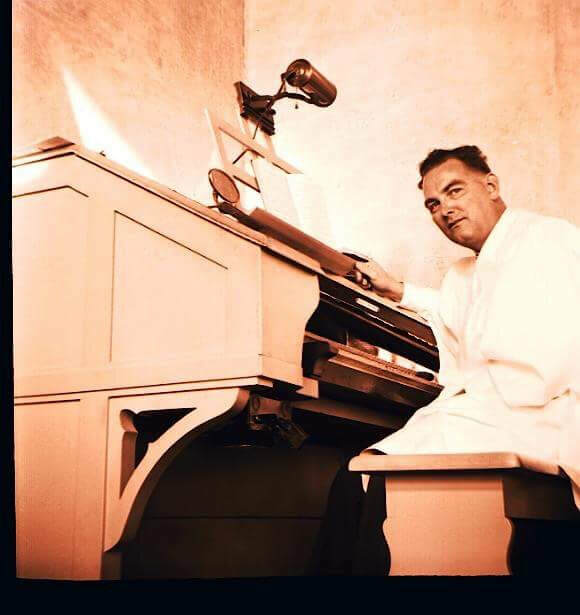 On March 24,1956 a new Wicks 2 manual pipe organ, console and chimes were presented to the congregation at the First Methodist Church in Del Rio in memory of C.B. Wardlaw, by C.H. Whitehead and Mrs. Nettie Coalson Davis. ​Our organ consist of 13 ranks,a little over 1,000 pipes and utilizes what is called an electro-mechanical action.Each note of every stop in the organ has it's own valve, and applying low voltage electric current to the unit causes the valve to immediately open. Cutting off the current lets the valve close. 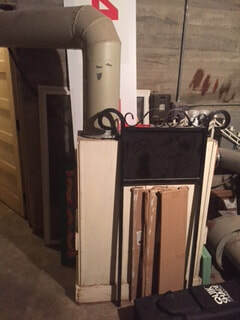 The blower motor and ductwork that supplies the wind and air pressure to sound the cylindrical metal and square wooden pipes is located in the sub basement below the The House of Friendship and makes it's way all the way to the 3rd floor to opposite opposing ranks of pipes. The chimes are located high above the ceiling in the middle of the choir loft behind a screen. 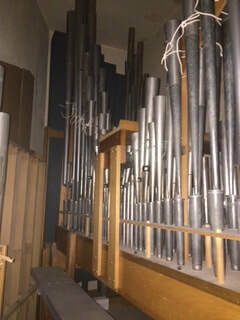 Some of the pipes from the original organ were reused and reinstalled into the present organ.It is quite possible that when you hear our organ being played you might be hearing some 87+ year old pipes sounding from this grand and heavenly sounding instrument. ​ Click the below link to hear a sample of our organ. 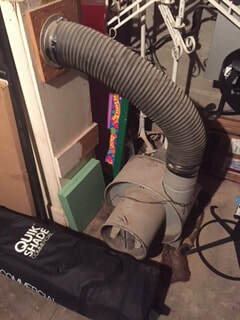 Air is sucked into the blower intake and forced into this large flexible hose.Past Choir Director and Organist Tom Cole recalled one Pentecost Sunday when a plastic bag got sucked into into the motor and sent billows of smoke into the sanctuary through the bellows. Talk about the Holy Spirt descending! More deep bass pipes next to the "shutters"
Wooden flue pipes on the other side rank, and also known as labial pipes. The pipe with pressurized air makes it's way up from the sub basement up to right outside of a door by the House of Friendship going straight up in a pipe all the way to the third floor. ​ The pressurized air goes into several rectangular reservoirs and bellows for added pressure which also helps to sustain a note or notes for as long as the air is available in the sub basement or there is electricity. From this point the large pipe splits off going further up and over to the other side of more ranks of pipes. Some of the larger bass flue pipes above the reservoir.Some of these pipes are from the original theater organ from the MajesticTheater ; close to 87 years old. Tiny pipes smaller than a pencil and very fragile along with wood pipes with the tuning metal curl on top. These supply the highest sounding notes or treble notes. Notice the blue color in the middle. The shutter is partially open and those are the Stained glass windows on the west side.of the church. The shutters and the blue color of the stained glass windows. On the console of the organ where the keyboard is located, look below and you will see 3 expression pedals ,like gas pedals in a car. Depending on which pedal the organist presses, will open or close the shutters thus decreasing or increasing the loudness of the organ. When a note is to be play extremely soft or pianissiimo. (ppp) the expression pedal is not pressed at all. When it is loud, the expression pedal is pushed down a little thus opening the shutters to forte (f) or even triple forte (fff) at all the way down. ​Our organ is unique in that both the great and swell part of the organ are controlled by the shutters. It gives much more control to the organist. Hint.... a series of bellows and levers operated by a team of men and boys and in some cases horses and mules! The very first pipe organ that our church had was a used Wurlizer theater organ that came out of the Majestic Theater in San Antonio as they were upgrading to a larger more modern model. The organ was up against the wall.Notice the "horse-shoe" shaped console. Notice the round "shaving mirror" This aided the organist to see behind him/her at offertory time when the ushers were ready to return to the front of the church or when brides were ready to come down the aisle at weddings. The organ console was massive and made of solid oak. 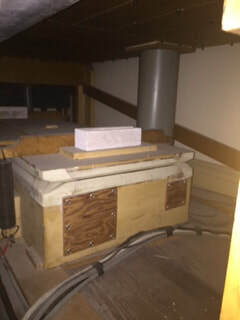 ​Before the elevator was installed,when a funeral occured,caskets had to be taken up and down the 17 steps by the pallbearers to the hearse. 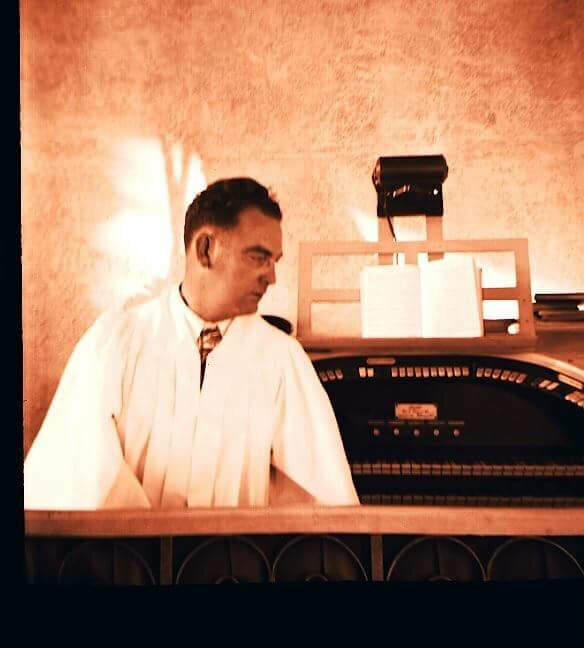 The 1956 Wicks 2 manual console is our 2nd pipe pipe organ in this church.Notice the 3 pedals below. These are the expression pedals. They work by opening the shutters to have the organ sound soft or loud.The organ is divided into 3 parts.The 7 white tabs above the black and white keys on the far left control the various stops of the pedal rank or the lowest pitch sounds,or largest pipes that the organ is capable of making. Some are 16 feet pipes! The 16 tabs in the middle is theSwell Organ and the remaining16 tabs is called the Great Organ. The 8 round buttons below each manual are called presets which the organist can preset a combination of different stops and push changing the different combinations that the organ can produce.There is also a switch to turn on the chimes. There is one toe stud for organ registration usage,above the full AGO concave pedalboard.